Since September 1975 when The Rocky Horror Picture Show first opened at the United Artist Theater in Los Angeles, California, fans have been returning to experience what many call the first interactive film experience time and again. On Friday, October 30, 2015; 8:30pm join fellow fans and newcomers at the Center for Visual Arts Outdoor Courtyard for a screening of the cult classic The Rocky Horror Picture Show. Get your Halloween makeup out a day early because this interactive campy “Rock-Horror Film Musical” draws devoted followers who dress up as film characters and return to watch and be part of the interactive experience time and again. 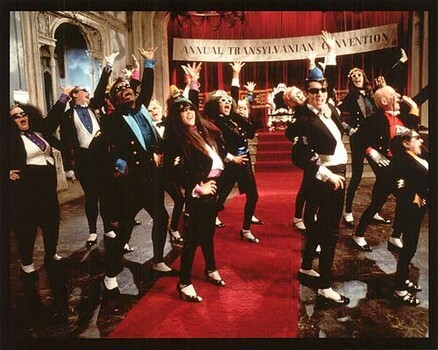 Rocky Horror is the first true audience participation movie where people yell back lines at the screen during the extended pauses between dialogue, dress up in costume, act out the film, and throw props (available for purchase) during the film. Don’t worry about bringing props with you to strategically throw at the screen because CFABS has crowd safe props available for purchase. And because many people come dressed as their favorite character, CFABS is giving a free raffle ticket for fun prizes to anyone who comes in costume. Refreshments including beer and wine all make for a great evening. Tickets for “The Rocky Horror Picture Show,” are $10 Tickets may be purchased at the door 30 minutes before the showing or by calling 239-495-8989. Information is available at http://www.artcenterbonita.org. Those who join the Centers for the Arts for the first time as an individual member receive two VIP tickets to a select Live at the Center performance. The Centers for the Arts offers this benefit for first time members for select performances. The Centers for the Arts offers a full performance and film series including “Meet the Composters Classical Music Series,” November 1, 3pm, “Guitar Legends,” November 5, 8:00pm and “Films for Film Lovers” foreign and independent film series on Monday evenings. Tickets for all of the events listed can be purchased at http://www.artcenterbonita.org or by calling the Centers for the Arts Bonita Springs at 239-495-8989.